Ponds and the Red Storm (17-6, 5-5 Big East) kept it up in the early stages of the second half, going up by as many as 15 points, 49-34 with 15:34 left to play. But Marquette used a 9-2 run, capped by three of Sam Hauser’s team-high 19 points, and the Golden Eagles would climb to within one point, 56-55 with 5:53 remaining. 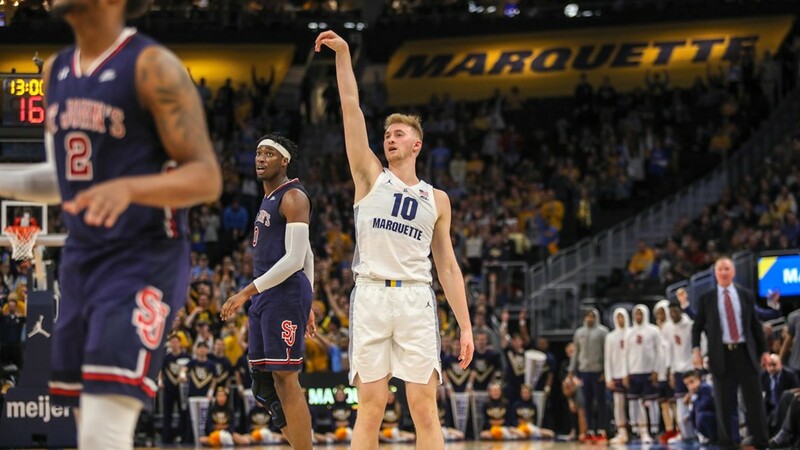 St. John’s would build the lead back up to six, but the Golden Eagles chipped away and three pointers from Hauser and Sacar Anim gave Marquette a 69-68 lead. But Ponds was too much again. He scored the Red Storm’s final 10 points, and 15 of its last 16, including the game winning layup with 11.9 seconds left after his defender fell down. A pair of late shots by Markus Howard and Sam Hauser were off the mark and the Red Storm prevailed. Howard finished with just 17 points (5-of-17 shooting). Hauser also had 10 rebounds to lead Marquette. It’s the first regular-season home loss for Marquette since they last lost to Providence at the Bradley Center on Feb. 3, 2018. Shamorie Ponds has now averaged 29.3 points per game in his last four outings against Marquette. 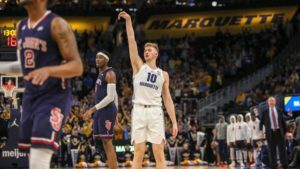 The Golden Eagles return to Fiserv Forum on Saturday when they host Villanova.